The financial crisis that has gripped the US since July last year, described by the International Monetary Fund as the worst since the Great Depression, reached disastrous new international proportions in the past fortnight as major banks and financial institutions toppled like dominos. The White House appears to have suspended its devotion to the ‘free market’ and stepped in to nationalise huge losses using taxpayers’ money. The crisis has been triggered by the slump in the US property market, with house prices at their lowest level in 20 years. The mass default of mortgage and loan repayments that began in 2007 – the so-called subprime mortgage crisis – has left the banks with ‘financial toxic waste,’ massive debts that are unlikely ever to be repaid. So far this year there have been foreclosures on more than 1 million homes as a result of failure to keep up with mortgage payments. Business Week warned in July that mortgage-related losses “could cause a trillion dollars in credit to vaporize”. As a result of the popular default on mortgages, the banks have now written off more than $100 billion in assets and several banks have lost at least a third of their capital. Only two of the five major US investment banks are still standing after Wall Street giant Lehman Brothers filed for bankruptcy on 12 September. A few months earlier, the Federal Reserve Bank (FRB) had invoked a Depression-era law to provide Lehman and other banks with billions of dollars in emergency low-interest loans, but this was not enough to keep it afloat on its worthless mortgage-backed securities and $639 billion in assets vapourised into thin air. 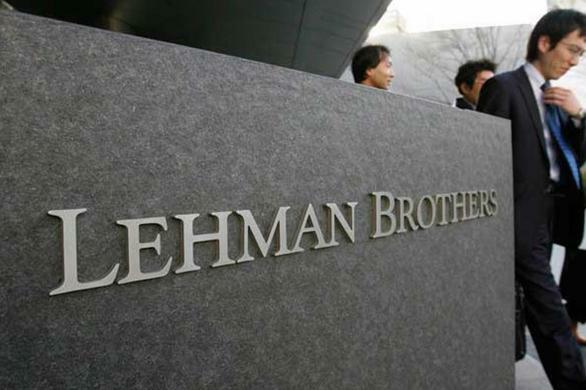 The decision to let Lehman Brothers go to the wall was described by several economists as “an enormous gamble” and shock waves spread around the world economy. Wall Street firm Merrill Lynch was taken over by the Bank of America later that day in order to avoid bankruptcy and the British Government suspended counter-monopoly measures to allow Lloyds TSB to buy up the faltering Halifax Bank of Scotland (HBOS), sparking fears of the loss of tens of thousands of jobs as the new banking giant cuts costs. On 17 September, faced with the collapse of the world’s largest insurance company, American International Group, the US Government handed over $85 billion to prevent it from going under, effectively nationalising the company. AIG, with its $1 trillion global balance sheet, was “too big to fail”: the repercussions in the US and international economy would have been disastrous. The bailout of AIG is the latest in a series of rescue packages and nationalisations by the Federal government in the past six months, starting with the FRB’s decision to fund JP Morgan Chase’s takeover of investment bank Bear Stearns with $29 billion in taxpayers’ money. The Treasury spent $200 billion nationalising the two key Government-sponsored mortgage companies Fannie Mae and Freddie Mac, which own or guarantee almost half of the US’s $12 trillion in mortgages. Each week there seems to be another financial institution collapsing or coming close and the Republican Government, champion of laissez faire capitalism, has intervened in the economy in a way unseen for decades to try to limit the credit infection spreading. In the wake of the Lehman fiasco, US and European banks pumped $180 billion into global financial markets in an effort to stabilise them. Now in a move that has been described as “the mother of all bailouts”, the Government has asked Congress for $700 billion to buy up “distressed assets” – or bad debt – from financial institutions and establish what would essentially be a skip for the banks to dump their toxic debt into. It is unclear how the debt would be priced, and what losses the banks would take. Media reports said that Treasury Secretary Henry Paulson resisted calls for the inclusion in the rescue programme of assistance for homeowners facing mortgage foreclosures. It’s unclear whether these measures will be enough to stabilise the global financial markets in the short to medium term because the growth in the finance sector has seen the rise of a ‘shadow’ banking system, especially in mortgages, that is beyond public scrutiny or regulation: no-one knows where the financial toxic waste is buried. What is clear is that the Wall Street crisis will exacerbate the problems in an already deeply troubled US economy, with falling growth and a falling dollar, the collapse of the property market, rising unemployment and soaring fuel and food costs all symptoms of the unfolding recession. But where has this financial crash come from? Can it really be just a ‘subprime mortgage crisis’ or the result of a housing slump? And did economists really not see it coming? The bursting of the housing bubble has sparked the explosion of deeper, underlying problems in an economy that has long been running on speculation and mounting debt. After the 1970s global recession hit, and investment in traditional sectors of the economy like manufacturing became less profitable, investment in financial assets – shares, bonds, bank deposits and securities – turned into the big profit-spinner. Buying financial assets is investing in a claim on the new profits a company may make in the future, and the stock market is the casino where people can speculate in these claims on future profits. Between 1973 and 2008, mirrored by the decline in American manufacturing, the financial services sector rose from 12 per cent to 21 per cent of total US GDP. In 1980, world financial assets amounted to 119 per cent of global production; by 2007 that had risen to 356 per cent. But it’s illusory wealth; it exists on paper. Since the slowdown in the world economy from the 1970s, there’s been a period of stagnation in investment, so governments and business have tried to stimulate demand by blowing up speculative ‘bubbles’. As speculation has become a larger proportion of the global economy over the past three decades, we’ve been hit by a series of bursting bubbles. Following the 2000 stock market collapse in the US, the Government and bankers lowered interest rates and tried to create another bubble – this time in real estate. The latest bubble bursting has impacted especially badly on ordinary people because the speculation was on people’s homes. Since 2000 in the US, there has been the slowest growth in the ‘real’, or productive, economy since the 1940s and the greatest expansion of the financial, or paper economy, in US history. Credit has been used as another key tool to try to stimulate the economy, leading to phenomenal levels of debt. US Government debt is now 53 per cent of GDP; household debt is 98 per cent and business debt is 72 per cent. The financial sector debt is 112 per cent of GDP. The subprime mortgage crisis is a consequence of providing high-interest loans on a mass scale to households on low incomes that can’t get normal mortgages. As people have been increasingly unable to service their mortgages, the value of all the financial institutions based on this debt has plummeted. The heightened risk of depending on the housing bubble to generate profits was that investors were actually trading on debt. They took mortgage loans and “securitised” them, turning them into special investment vehicles that they could trade on. A shadow banking system of complex forms of insurance and speculation grew up to support the inflating bubble, including ‘hedge funds’. The investment vehicles that held these new mortgage-backed securities were collateral debt obligations. The unregulated market for ‘credit-default swaps’, which are a form of insuring against credit default for bondholders, swelled to an unbelievable $62 trillion before the bubble burst – about four times the annual US GDP. Last July, Bear Stearns found that it couldn’t put a value on a number of hedge funds that were ‘contaminated’ with collateralised debt obligations that included subprime mortgages in them. One of these hedge funds lost 90 per cent of its value; another lost its entire value. This marked the beginning of the current crisis as the financial world began to realise that the enormous values they had placed on these financial instruments were meaningless, just paper wealth. This realisation fuelled the panic that has prompted the string of collapses and bailouts. So how were these banks and firms able to make such a colossal mess of international financial markets and of people’s livelihoods and homes? Mainly because as finance has grown as a proportion of the economy, it has been increasingly deregulated by governments as a way to facilitate the expansion of speculative opportunities. The deregulation of the global finance market was spearheaded in the 1980s by Ronald Reagan and Margaret Thatcher. Each act of deregulation opened up new opportunities to gamble on the future movement of any financial market and borrow on the basis of predicted rises in asset values. A key change brought about by deregulation was in the role of big banks and firms, which went from just being intermediaries to having the power to invest of their own accord. In 1933 after the Depression, the Glass-Steagall Act was passed in the US to prevent banks from making unregulated investments and basically gambling away the savings of their customers. In 1999, this act was repealed, allowing commercial and savings banks to rejoin the ranks of the investors. After this, banks were enabled to finance risky investments provided they set up their own ‘affiliated’ investment bodies – such as hedge funds. This shadow banking system has spread rapidly since 1999. The Federal Reserve Bank said it had more than $10 trillion in assets by early 2007, making it as big as the traditional banking system. But while the shadow system didn’t have the same restrictions on its activities as the traditional banks did, it also lacked their status, federal protections and access to short-term borrowing during rough times – so when the mass mortgage defaults hit, the shadow banking system began to crash, infecting their associated banks and firms as well. Because there is no transparency in this shadow system of private trading, and the world of finance is so inter-connected, no-one knows where the toxic debt lies: no-one knows who owes what where. It is impossible to accurately predict chain reactions from collapses or even for the Government to accurately assess at this stage which institutions are salvageable and which are terminal. The first priority in dealing with the crisis is stemming the contagion; the $700 billion toxic debt dumpster and bailouts are part of this strategy. But Kenneth Rogoff, the former IMF chief economist, said: “It is hard to imagine how the US government is going to succeed in creating a firewall against further contagion without spending five to 10 times more than it has already, that is, an amount closer to $1000 to $2000 billion”. The finance sector needs to be recapitalised, which will have to be mainly at the public expense. Already the Treasury rescues of big private financial firms and banks have socialised massive losses and now leave the public to foot the bill of irresponsible lending, manic speculation and shadowy financial dealing. The FRB’s assets are being eroded by the crisis. In June 2007 92 per cent of the FRB’s assets were from Treasury securities. Today Treasury securities are only 54 percent of these assets, having been replaced by loans to financial institutions, some of which are unstable and whose shares have been falling. It looks like seriously dark days ahead for the US economy, which will of course impact on the rest of the world. Economists are predicting that housing will sink further and the number of mortgage defaults will rise; that falling tax revenue will lead to cuts in social spending; and that unemployment, which has this year risen to its highest level in two decades, will continue to rise. Credit will dry up to an extent as banks are forced to raise interest rates to replenish their cash reserves, decimated by this crash, which will have a brake effect on the global economy. There are some militant neoliberals, in the US and Europe, who are arguing that governments should step back and let the ‘natural’ economy take its course, let the crisis play itself out, and never mind about the poverty, spiralling unemployment and home repossessions that would bring. Obviously the Government needs to act to bring the crash under control. The real question that’s raised is what type of control: the systemic, chronic contradictions of the economy demand more than temporary public bailouts. Re-regulation of the financial sector including the shadow bank system is vital to preventing such a disaster unfolding in the future. And even traditional economists are questioning the wisdom of allowing a return of the financial sector to private hands once it’s been nursed back to health by the Government.